Hey guys! Since I’ve gotten a good video recorder (software) installed in my computer, I’m happy to to play all the games that I have. There are just too many games that I’d like to tackle but I’ll be writing about Mega Man 5. It is a NES game and it has been a while writing games about this console. I think I like all the Mega Man games… I even wrote an older post a few days ago: Mega Man 3. In reference to my previous post about the Mega Man 3 music, I would like to ask you and hear out this cool-old-fashioned music, there’s also a little story, so press the play button. Neat isn’t it? If not, that’s OK because we are different and I’m sure you can understand what I’m trying to say. I just wanted to express how great it was playing in the old days (not that I’m complaining about the music that games produce today). I’m sure we can agree that the video above gave us a summary of what happened… Proto Man abducted Dr. Light! And we can see the confusion on Mega Man’s face, he’s wondering “Why Proto Man?” You’ll know soon… when you end the game… heh. -but heck, (SPOILER ALERT) it wasn’t really Proto Man, it was Dr. Wily, he’s always behind all these attacks and schemes but Mega Man was there to fight and save the day. The gameplay is great! 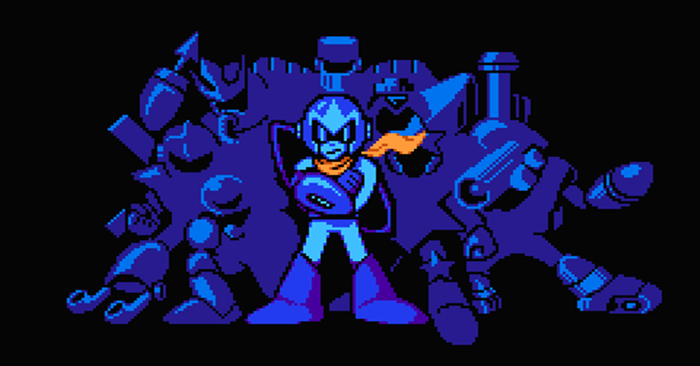 After the title screen, you are asked to choose a robot master to defeat. Every boss has their own territory of their expertise, you’ll need to defeat 8 robot masters and beating one will give you a power upgrade that allows you to use in the next stages. The power gained can be helpful as it may be the weakness to the next boss you fight. And let’s not forget about Rush, Mega Man’s dog companion, where he aids you through different platforms of the stages. Same as the previous Mega Man games, Mega can shoot with his buster arm with a press of the B button and holding B will allow your character to “charge” for an additional boost of damage and size. A is for jumping, holding the down button + A has a slide action. All in all, it’s a great game to play with, all the tricky platforms on each stages, the charge ability, the utilization of weapons and the music! Goodness, the music is so upbeat which makes me want to play more. I liked this game since it challenges my hand-eye coordination and I need to organize my move to avoid enemy attacks as much as possible, cause fighting a boss with half of your life is very difficult, unless you’re a pro. Here’s a video of me playing Gravity Man’s stage! I died so early in the game, eager to get that 1 up life. I also demonstrated how Gravity Man’s power can be used. Big fan of this game. My favorite among the Megaman NES series. Gonna download and will try to play this again. Keep the posts coming! Thanks for that great comment! I’ll keep you guys updated with more posts to come!